The $2,500 Tata Nano is the cheapest car in the world, but as Avinash Rajagopal of Change Observer tells us, its low price tag may irreparably damage Indian society. — Ed. The Tata Nano has arrived in the United States. The original plan was to ship it here, but at 1332 pounds, the little Indian car turned out to be light enough to fly. It traveled in airborne style to New York's Cooper-Hewitt National Design Museum, where it was on display. The world's cheapest car has had a long journey, and it has generated attention and controversy every inch of the way. In 2003, when Indian business magnate Ratan Tata announced his intention to develop a car that would sell for Rs.100,000 (about $2,000), he caused a furor. Other car manufacturers simply refused to believe him. Environmentalists saw it as a small car with a big footprint: At such a low price, cars would flood Indian cities. As Tata's dream approached reality, however, support for the Nano grew. The car was unveiled at New Delhi's Auto Expo in 2008. Leading environmental research groups in India continued to denounce the Nano, but public opinion swelled in its favor. Standing today on a low gray platform in the Cooper-Hewitt's Great Hall, the Nano looks rather pleased with itself. Designed by Tata Motors's Girish Wagh with input from Justin Norek, of the Italian consulting firm Trilix, the Nano's body is compact and muscular, its face equipped with a sly smile. The jaunty sunshine yellow glows in the wood-paneled hall, and a door has been opened to reveal interiors that can comfortably seat a family of five. As people walk by, the word "cute" is distinctly audible. It is a car with international appeal, and Tata Motors has already announced plans to sell a version of the Nano in Europe by 2011. In capturing the world's imagination, the Nano has become a point of national pride for Indians. Prashanth Aare, who teaches at a business school in the city of Hyderabad, says his seven-year-old daughter no longer likes sitting in his new Nano. "She gets irritated because people keep coming up to touch the car," he says. "Then they want to ask questions about the car's performance and mileage." Within a few months of its launch, the Nano had 203,000 Indian orders. More than half of these cars have already been delivered, and Tata began its second booking period early this month. "Soon, the Nano will be as common as scooters," Aare says wistfully. Two-wheelers, specifically scooters and motorcycles, are pervasive on Indian roads because cars have largely been out of the financial reach of the country's middle class. The Nano, at a price that competes with most second-hand cars in India, is aimed at changing that. Indeed, the Cooper-Hewitt praises the Nano for providing safer transportation, empowering its users and "changing the way they live and work." But increased safety and empowerment aren't the only implications of replacing two-wheelers with Nanos. India's cities are already notoriously gridlocked. Residents of smaller cities, where cars are an aspirational buy, account for more than 50 percent of the Nano's purchasers. But their roads are simply not wide enough to face an onslaught of cars. Even in the larger cities, traffic tangles and the resulting emissions resist any kind of solution. Addressing shareholders in 2008, Tata explained that the Nano could hardly be held responsible for worsening Indian traffic. Eighty million two-wheelers are driven on Indian roads today, a figure that dwarfs the country's 14.5 million cars. Even if a million Nanos were sold over the next five years, they wouldn't represent a substantial increase in the total number of cars. However, it now appears that, in those five years, the Nano will not be the only cheap car on Indian roads. Renault-Nissan was the first to emulate the Nano model, announcing in 2007 plans to produce a $3,000 car in three years. Toyota, Volkswagen, and Hyundai have all followed suit, and most of these companies are eyeing India as a manufacturing hub for small cars, which can then be introduced to other developing markets, such as Russia and Latin America. "The problem is not just the Nano, but all cars," says Anumita Roy Choudhury, associate director at New Delhi's Centre for Science and Environment (CSE). "As Urban Planners, we should send out a policy message by not strengthening car-centric infrastructure, and by investing in public transport," she adds. But what kind of public transport should they be investing in? In recent times, growing cities such as Hyderabad and Bangalore shifted focus away from road infrastructure and invested heavily in underground metro systems. In hoping that a strong alternative public transport will take pressure off the roads, they seem to be ignoring what Chowdhury calls "the middle-class aspiration" — people will still want to buy cars. The Nano seems to have ensured that the solution for traffic control will have to be found ­­above ground. 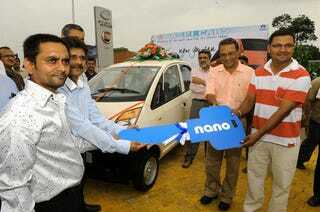 Ahmedabad, home turf for the Nano, seems to have found one response. In October of last year, the city launched its Bus Rapid Transit System (BRTS), a network of high-speed buses operating in corridors specially created for them on the city's arterial roads. Over 18,000 people now use it daily, and this number is set to grow. The team that developed the system recently went to Washington, D. C. to receive the 2010 Sustainable Transport Award. M. P. Ranjan, senior professor at India's National Institute of Design, is jubilant at the project's early success: "Property values along the corridor have shot up, people are responding with their wallets! Very promising. The Tata Nano has indeed come to town and the city is responding, thanks to some local vision." Vision is certainly what policymakers will need. While the Nano smiled benignly in the Cooper-Hewitt, lapping up all the accolades, it has wrought a revolution on Indian roads, sending urban planners scrambling for responses. The answers they find will have implications for the rest of the developing world, and by extension, for the future of the planet. Avinash Rajagopal studied industrial design at India's National Institute of Design. He consulted on industrial design and visual merchandising projects with leading manufacturers and NGOs before returning to NID as a research associate and visiting faculty. He wrote this article on the Nano for Change Observer — a channel of Design Observer devoted to the many dimensions of design for social innovation.